Fast forward three years later and we were at an event that gave our Ring Pops. Pete and I each took one, but I wouldn't let us eat one until I came up with a great project for them. Three months later, we can finally enjoy them. 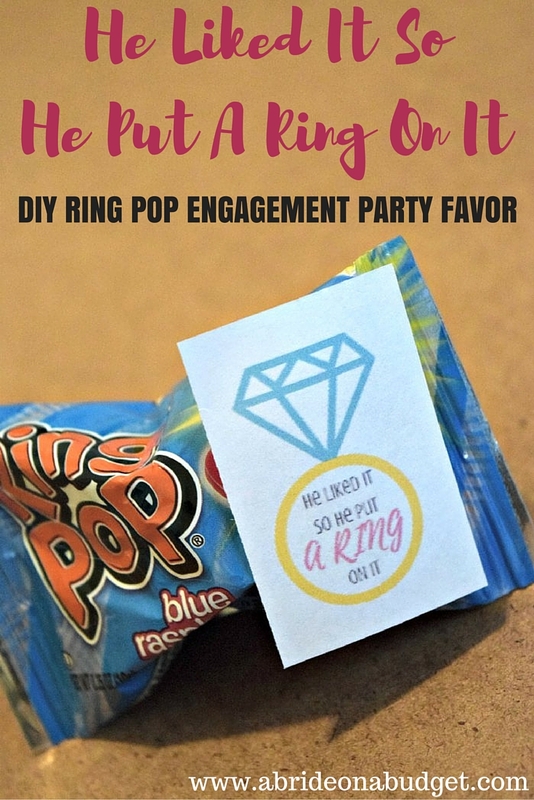 I made these super cute "He Liked It So He Put A Ring On It" DIY Ring Pop engagement party favor. This is completely a play off Beyonce's Single Ladies ... which has been stuck in my head ever since I started making these. And, probably, Pete's head too because I've been singing it all around the house, all day, every day. "Wuh uh oh uh uh oh oh uh oh uh uh oooooooh"
All day long, people. All. Day. Long. 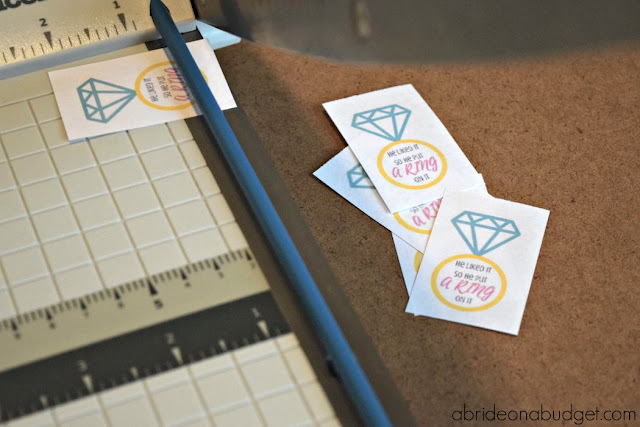 Cut the "He Liked It So He Put A Ring On It" into individual rectangles. You can eyeball this, but if you're like me and it has to be exact, you want to cut them 2 1/4 x1 7/16. Stick a piece of tape on the back and affix it to the Ring Pop. That's it. You're done. 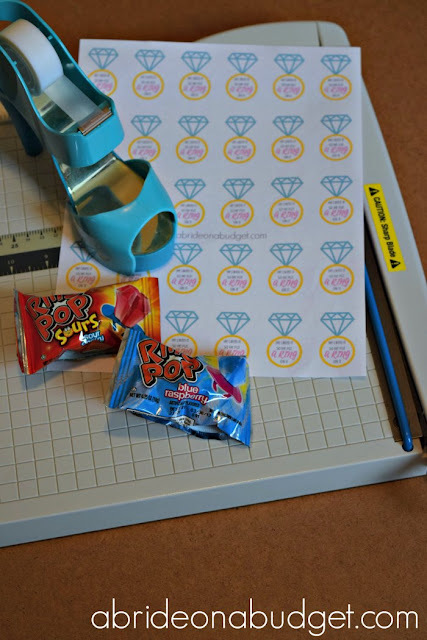 You have a tasty engagement party favor that can be completed in a matter of seconds. It's formatted to fit a standard printer 8.5x11 piece of paper so you can print at home. Just right click that image, save it to your computer, and you can print it at any time. 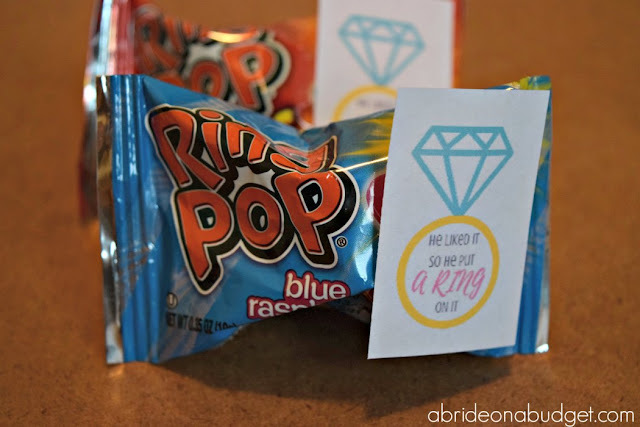 BRIDAL BABBLE: Would you make these DIY Ring Pop engagement party favor? 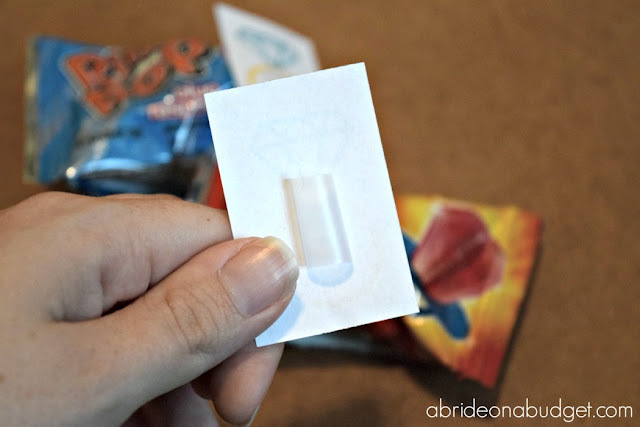 What an adorable idea for an engagement party favor--and really very economical. 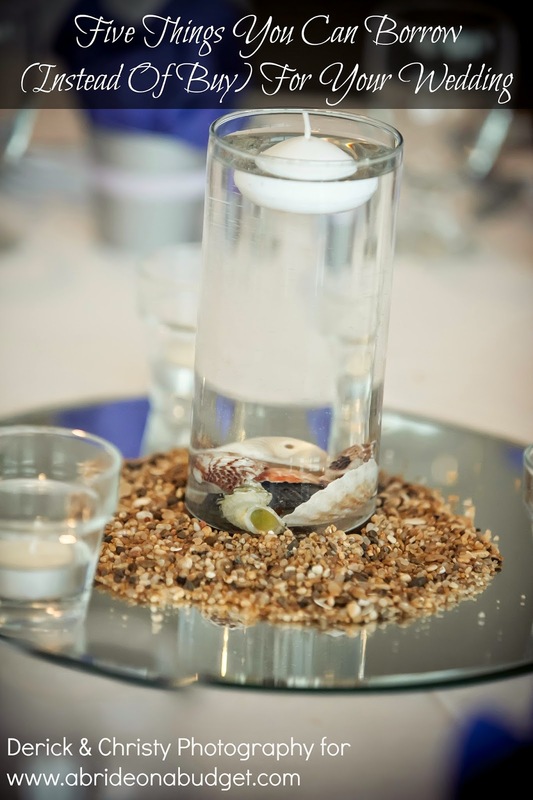 It is sure to bring smiles of happiness and remembrance to all the party attendees. Super cute!! 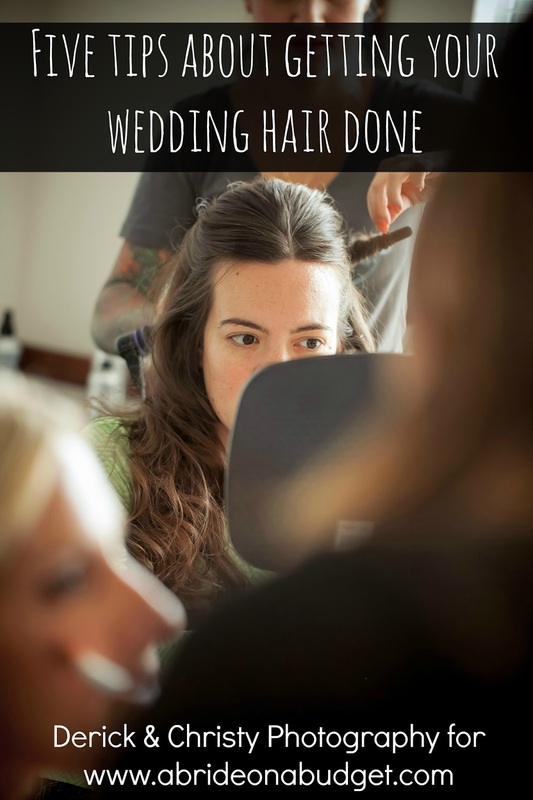 I know a few brides to be I can share this with. I love this!! What a great party favor, I think this would be fun to hand to girlfriends to announce your engagement as well. This is such a great idea. It is fun and just adorable. Thanks for the share. 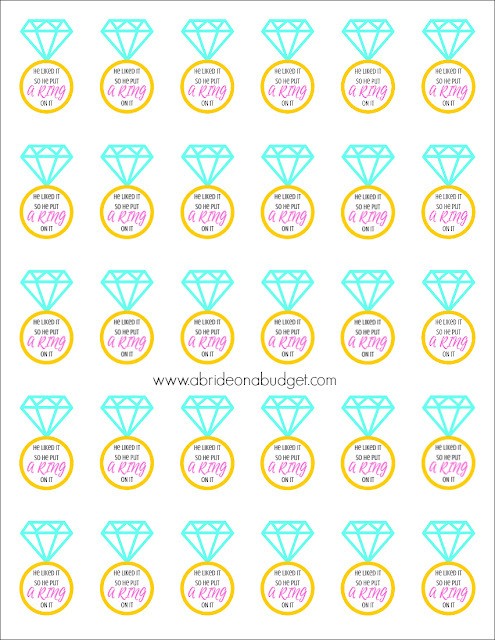 This is original, and perfect when you're planning on a budget! What a fun idea! I really like that it frugal and so easy to create! 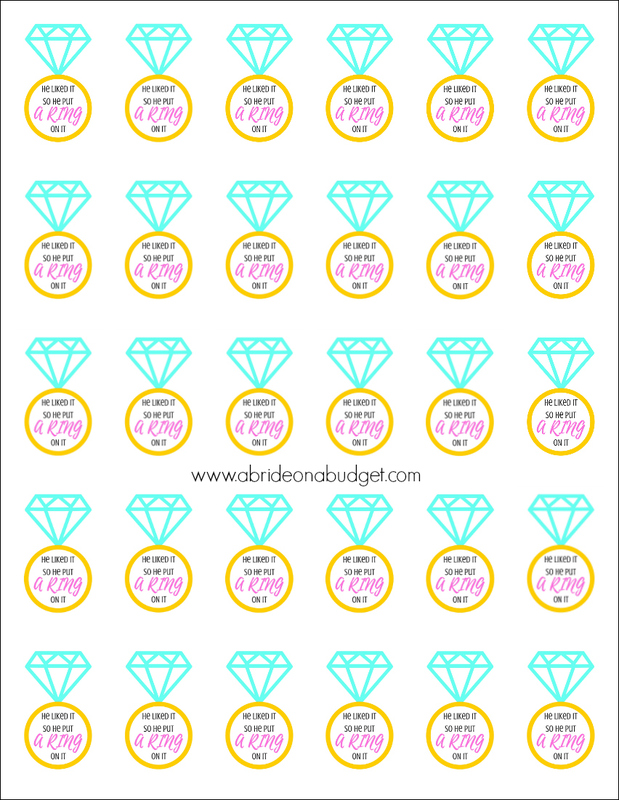 Thanks for sharing your free printable! I love this so much! 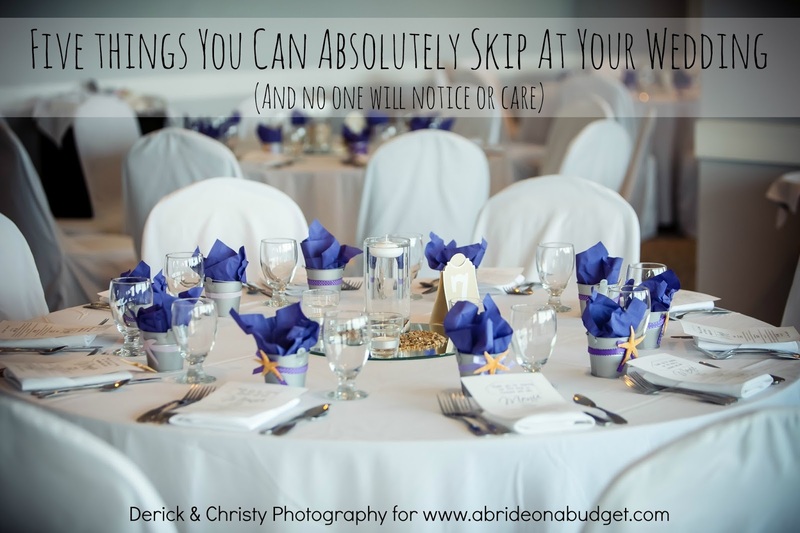 So many people just go overboard with wedding favors - when I can honestly say that I don't remember a single wedding favor that I have ever received! It's simple and cheap! That printable is just too fun! I love outside the box ideas.